My first church was a tiny one in northern Minnesota. When I say northern, I mean northern; you could walk through the woods behind our house to the Rainy River and look across it to Canada, if the mosquitoes didn’t eat you on the way. In a white country church house with six pews on the right and six pews on the left, an attendance board on the front wall and a plaque that read THE TRUTH SHALL MAKE YOU FREE, and paneled walls that revealed to my childish mind the fanciful figures of owls and cats, I formed my first ideas of God and his people. Folks tended to sit in the same places in those pews: my grandparents on the front left, Amos and Rebecca across from them on a cushion for their aging bums, dear old Edna Schell behind them, and our family next. I attended school in the basement of that church house. I jumped rope with my friends on the concrete pad by the door. I knew where the huge ant hills were, in the grass beyond the building, and where the forest of tiny evergreen trees grew, and how to use the outhouse when the one-hole unisex bathroom indoors was occupied. Children went to church barefoot on Wednesday nights in summertime. When the leaves fell, we studied our school books downstairs, and played softball in the backyard. In winter, we Christmas caroled for hours, all bundled up, and then met back at the church house for chili soup and treats. In the spring, we had an Easter sunrise service and a hot brunch. Our larger sphere included two other small congregations we fellowshipped with. Our policies were not identical, but our faith was stronger together. We were the only three Anabaptist churches in the region. Non-Mennonite friends and neighbors formed a significant chunk of our social interaction. I know things were not all perfect there; I was much older before I heard the backstories. But I have never met anyone who didn’t speak of those little churches with fondness and joy. To say I knew all the people in my church is like saying I knew all my siblings. I had a personal connection to each one. I knew to watch out for my friend Jo’s dad, because he liked pulling braids as if they were horse reins. I knew baby Morgan, who had no hair, and her beautiful mother Jeanette, who pulled a long lacy prayer veiling out of her purse when church began, because she came from another denomination and draped her head during services. My friend Jane was my role model, a few years older, capable, artistic. Rebecca, who at sixty-something was ancient and earnest, loved my age group and frequently taught my Sunday school classes; Jane C was a great teacher too and always tucked an object lesson into her bag. We bought raw milk in gallon-sized glass jugs from our friends Les and Joan. My uncle John walked around the church house with scissors, snipping runners off the unraveling orange carpet. Florence Reimer was the school teacher, tall and regal, and June Peggar was just June, always there: my father rushed from our property to help when her house lit on fire. Grandpa Eli pounded his pulpit. Asher and Kristi were adorable babies. I always wanted to talk the way their mother Rachel did because the corners of her mouth looked so pretty; I practiced in front of the mirror. There was always someone to play with. Not many, but someone. My cousin Justin was my best friend, and Jo and Sonny were always nearby to fight or play games. Later, Rachel came, a redhead who became my first close girlfriend. I shared a baptismal class with Matt and Louise, cleansing water trickling down my head when I was ten years old. From then on, I was a voting member of the church, taking communion, kissing the other ladies as a sign of peace. I suppose that in most congregations, the young are the favorites of the old, but in my church, the opposite was also true: the old were the favorites of the young. We’d never heard of generation gaps. Everyone loved everyone. I remember one of the oldest men in our church racing the young boys across the yard just for fun, his bow legs twinkling. The oldest woman brought the best food to church potlucks, and always the same food: pot roast to melt in your mouth, and blueberry delight. Old Mr. Herman, in the next church over, told spellbinding stories from his early life. He said he’d be very surprised if the Lord hadn’t returned before he died; we watched him to see. Taps, named for her previous life as a barmaid before she found Christ, had fluffy permed hair and wrinkles on her face, and one day she gave me a drink of hot water by mistake instead of cold. Oh, HONEY!! she said, when she saw my face. The old of the community were storehouses of faithfulness, involvement, wisdom. They talked to us and touched our heads and called us by our nicknames. Children of the community, including myself, were light of the eyes and hope of the heart. We knew it, and the knowing gave us life. When I was eleven years old, we moved a thousand miles away, to a church community that might as well have been on another planet. There I stayed until my marriage. I suppose that at some level, all the rest of my life of faith has been an aching to go back. Very interesting! Your parents must be proud of your well-stated assessments. Thanks for sharing your memories. From an adult vantage point I think the distinct lack of generation gap is one of the things I appreciated most about growing up in that community. The inclusiveness of all ages in many activities and friendships. Those relationships with older people are things I still treasure. You cannot relate memories without adding a few quirks though. I’ll just share one. All the books in our church library were read by Edna during Wednesday evening services while she sat on the front bench. Lol! That I don’t remember. I did have a few other choice memories regarding her, mostly along the line of burps. Your first paragraph is spot-on. Love it. Shari, Thanks so much for sharing that. I was raised at Graceton MN in the 1950-60’s, Not the same era but I can picture many of the details you describe. We were able to attend my High School reunion recently and attended church one of your neighboring churches Sunday. Much remains the same and yes it revived the longing to go back. Praise God, He gives us rest and peace in whatever community He calls us to. I have heard a lot about Graceton! That outreach church is where Ryan’s grandparents met. Yes! And we as the Skrivseth family will be forever GRATEFUL for their Love and Sacrifice on our behalf! I’ve been reading your blog for several months now, (ever since you were a guest speaker in my class at Winter term FB) and have enjoyed it immensely. This, however, is the first time I have been moved to tears and compelled to respond. I have three churches that I ache to go back to. There is the one that I was born into, but my parents left when I was 3 months old. Then there is the congregation that I belonged to from the ages of 3 to 6. The third church I ache to go back to is the one I was a part of from the age of 24 to 30. Why, I have often wondered, do I ache to go back to these churches but not to the others that I attended? Why am I finding it hard to feel like I belong in my current congregation? What was the magic ingredient that made me love some places more then others? This question you have answered for me today with this sentence – “To say I knew all the people in my church is like saying I knew all my siblings.” It is the places where I have known and been known that I ache to return to. Thanks for sharing this snippet of your story. WOW! I grew up in a tiny, homey church, too, and I was feeling my own aching to go back the whole time I was reading this. “Saying I knew everyone there was like saying I knew my siblings” – what a great way to put it. The tiny details are so *sacred*, I don’t know why… I remember watching the flies that got stuck in the wispy hairsprayed perm of the lady who sat in front of us… ha. So many memories ~ wouldn’t it be something to be five again! Thank you Shari for sharing your church experience. I actually long to be at any of the conservative Mennonite churches we have the pleasure of visiting. We’ve only visited two but we visited two but we have made life-long friendships. I’m also in tears….it’s been almost twelve years since I married and moved. And while the marriage was worth it, the church life has been horribly hard. I resonate so deeply with your memories…..the senses you play on with your words tell me that your early church experiences and mine were very similar. And yes, there are always backstories. It begs the question from me…..do I expect too much from my church? Is this just how things are going to be? That doesn’t square with scripture. What is a godly response when there isn’t warmth and trust and acceptance and care in a church? I’m glad to say things are changing at my church but it’s been a rough road to get this far. Do you think your childhood church would feel different to you as an adult? I have wondered this about my own church experience. I grew up in an Amish Mennonite Church and, oh boy, I would go back to the Amish Mennonites in a heartbeat if I could. But then, that was before I knew about loneliness and isolation. That was before my thoughts and feelings and values were not shared by my fellow church members. That was before I really understood that church is where God IS. That was before the Holy Spirit taught me that church is a place for me to give my unraveled emotions and experiences to Jesus Christ as a sacrifice (Rom. 12:1, and Ps. 51:17). I don’t know, but now that I’m an adult, would my childhood church still be the same place it always was? Matthew 18:20 is the verse I reference when I think about church being a place where God is . You’ve touched a chord among many of us, Shari. The strength of my emotions as I read this were almost startling. I ended up with my face in my hands, weeping. Very nearly you described my own little church; down to being one of three in our area. But I stayed there. I grew up there, married there, became a parent there. But my little white church changed; it is no longer the church of my childhood. And then I moved. I’m crying again. My heart aches with the questions… Is there no way to keep our little white churches? Do they fade into thin air because we grow up? Do they disappear because of growth and affluence and change? Do I need to just stop longing for a mirage of the past or is there a way now to cultivate the community of my childhood? Reading all your comments made me cry. I guess I should pass the kleenex around. I didn’t mention that the very first Mennonite church I visited is no longer around. There was a disagreement and many left. That breaks my heart. I think churches change because the congregations think the “old ways” are too “old fashioned” and “restrictive”. We attend a Baptist church and I know there was a time when the Baptists were very conservative and didn’t conform to the world. 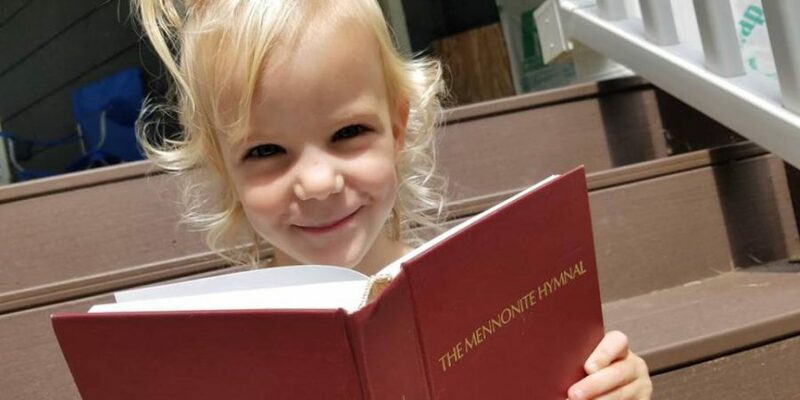 Sometimes I feel very lonely and isolated because I’m the lone ” Mennonite” if you will. There are marked differences between the childhood church you describe and mine, but mine was also a small, isolated, personally connected community. I was 20 when I moved 700 miles away, young and naive, to a world as foreign to me as you describe. The stages of leaving, losing, and reconciling have been many, and there’s much to be said for the parallels between leaving the warmth and innocence of our childhood church world and the confusion, uncertainty, sometimes disillusionment of entrance to becoming an adult. Now, as always, God discloses Himself to “babes” and hides Himself in thick darkness from the wise and the prudent. We must simplify our approach to Him. We must strip down to essentials (and they will be found to be blessedly few). We must put away all effort to impress, and come with the guileless candor of childhood. If we do this, without doubt God will quickly respond. When I take this approach God gives me the simplicity of a child. If I could only STAY there! My Childhood memories of church are unparalleled. Especially the elderly, they loved us & were loved in return. How does an old person just know how to make a child/teen feel so special? I was 19 months old when my parents took me there & then left at 17-1/2 years of age, with them, to move to another country. I visited the church of my childhood once more, as a, 35 year old. It wasn’t what I remembered. Can we really ever go back? Do we really want to? Wow, that was interesting story !! Thanks for sharing ? Wonderful recollection. What a joy to read. Thanks. It was fun to read about my church in this blog! But, for whatever reason I don’t remember you. Who’s your family and what year did you move? You don’t remember me because you were practically a baby when we moved. 🙂 Are you the oldest of Sam and Twila’s boys? I think there were two little ones when we moved away in the spring of 1994. I am John and Barb Coblentz’s daughter, Eli and Dorothy Yutzy’s granddaughter. My parents and grandparents lived in Minnesota for many years, but my grandparents followed us to Ohio in the fall of the same year, if I remember right. My father built the Vinar’s house (minus extensive additions since :)) and my grandparents lived next door to us before selling their home to Walter and Charlotte. Do you still attend church at Northwood? Oh, interesting, Shari . . . I moved to Northern Minnesota almost eighteen years ago! . . . Thanks for clarifying who you are, I was wondering that myself!!! I attended MARANATHA Bible School with your husband Ryan, I do believe . . . This resonated so much with me, but it was not the church of my childhood I long to go back to, it was a little mission church in WA where we were for 7 years. It was the best church experience we ever had, and yes, we were all like family. Until the devil decided to wreck havoc and now it is torn into pieces and we are all scattered elsewhere. It had been incredibly hard to feel a sense of belonging and connectedness in the new HUGE church we are at now, even though I do have a few close friends. I long to go back but there is nothing to go back to. And I grieve the loss….We were just at a wedding where a lot of the former families came together and some of us commented about the unusually close connection we still feel to each other. I am sad and wish we could just put the pieces back together again…but it seems impossible and improbable and I have to just learn to live with the new reality! And why was it that we always got beat when we played softball against Northwoods? That may have been before your days, Shari. 🙂 That I don’t remember! But I do remember the wonderful track-and-field days with your church, and I think we got soundly beaten ourselves from time to time.